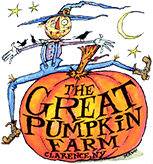 This weekend is the final weekend of the Fall Festival at the Great Pumpkin Farm in Clarence but, as with every other weekend, there’s no shortage of fun! On Saturday, October 28 and Sunday, October 29, the annual costume contest will take place, with prizes being awarded for Cutest Costume, Scariest Costume and Most Creative Costume. At 1:30 p.m. both days, prizes will be awarded in the ages 0-6 and 7-16 categories; at 4:00 p.m., prizes will be awarded in the ages 17 and up category. And – BACK BY POPULAR DEMAND! – Vinnie and Dino, the animatronic dinosaurs, will roam the corn maze from noon until 4:00 p.m. Saturday and Sunday, looking for prey! Girl Scouts of Western New York will be at the Fall Festival both days with FREE craft projects and information on joining the organization. As with every weekend at the Fall Festival, there’s something for everyone, including the corn maze, hay maze, magic show, Boo Barn, amusement rides and more. Guests can also purchase pumpkins, gourds, mums and cornstalks and visit the bakery for freshly baked pies, cookies, pastries, candy and cider.